Hello Everyone! It's Colleen Tyler from Maple Syrup Designs here another blog post for Craftin' Desert Divas! Today I will be showing you how to add some dimension to your cards. There are many ways that you can add dimension to your cards, so I have chosen a few techniques that I use often to highlight as I walk you through the steps of this card. 1. Stamp your image and colour using your preferred medium, for this card I have chosen to use Craftin Desert Divas' Sparkle Stamp Set, stamped using Memento tuxedo Black Ink and coloured using Spectrum Noir Illustrator Markers with the Spectrum Noir Clear Overlay Pen. 2. Cut out a cloud template along the edge of a scrap piece of card. Using your mini blending tool and Distress Ink in Broken china blend over the template edge onto the card, continue this process as you move the template all the way down the card. This adds a background layer of dimension to your card by adding depth. Stamp your sentiment in the bottom left of the card (leave enough room around the edge for a border). 3. Use a glue Pen and trace along the edges of the clouds, sprinkle on some Frosting Powder and heat set. When heat set the frosting powder raises up and becomes white and frosting looking adding texture and sparkle to the card. 4. Use the Inside Scalloped Square die to cut out a frame, add foam squares onto the back of the frame and adhere to the cloud base of the card. 5) Cut out the Unicorn and add a mini wobble Spring to the back. 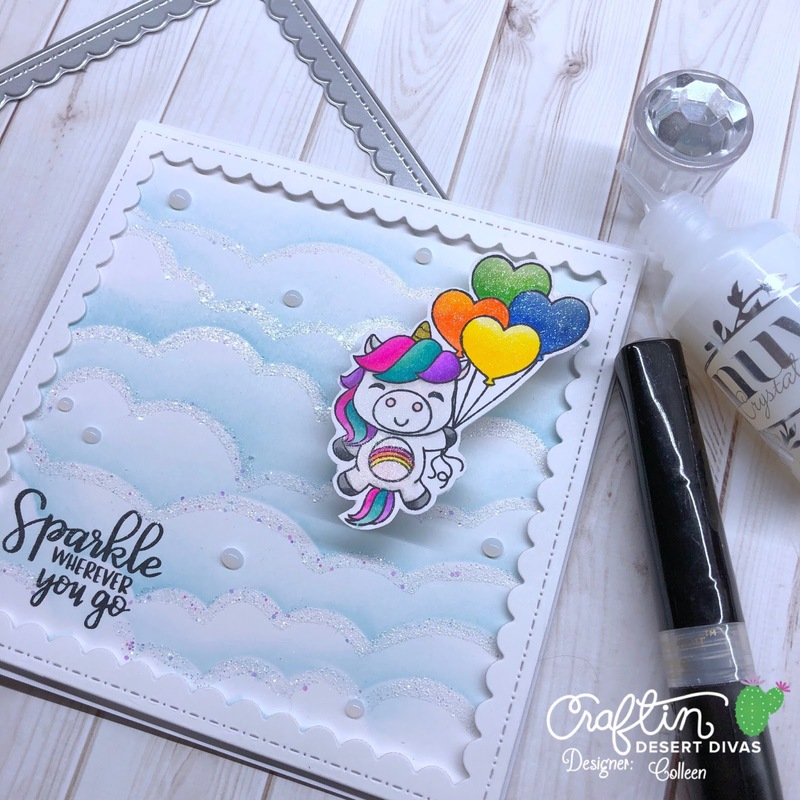 Both step 4 and 5 are quick and easy ways to add simple dimension to your card, and who doesn't like the added fun of a wobble spring to a card?! 6. For the Final step of Dimension I have added some Nuvo Drops in "Morning Dew" dotted around the card. I hope you have enjoyed and look forward to seeing what you make! Great idea. Absolutely beautiful card!! !